Tripp Lite Switched, Metered Rack Power Distribution Units enable a variety of advanced network control and monitoring functions by giving IT Managers the ability to turn on, turn off, recycle or lock-out power to each individual receptacle and remotely monitor PDU power consumption and in-rack environmental conditions. Switched PDU systems can be accessed, configured and controlled through secure web, SNMP or Telnet Interface. Individually switched outlets can be controlled via a built-in web / network interface, enabling remote reboot of unresponsive network hardware. User defined power-up and power-down outlet sequences ensure proper operation of interdependent IT systems and prevent inrush-related overloads as devices are powered on. Programmable load-shedding of less critical devices at user-defined intervals extends UPS uptime in response to power failures. Unused PDU outlets can be electronically locked-off to prevent powering of unauthorized hardware. PDU power consumption (current) is displayed locally and can be monitored via the web / network interface, with user-defined alarms to warn of potential overloads before critical IT mains or branch breakers trip. Supports real-time monitoring, notification and logging of all on-board reporting functions with user-specified alarm thresholds and actions for each reported condition. Switched PDU systems can be accessed, configured and controlled through secure web, SNMP or Telnet Interface. 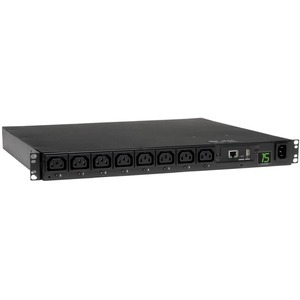 PDUMH15HVNET Switched, Metered, 1U rack PDU supports 15A maximum capacity at 208/230/240V (agency de-rated to 12 amps). Includes detachable C13 input cordset and 8 C13 switched outlets arranged in one unbreakered 8 outlet bank. Visual and remote current monitoring tracks the output current. 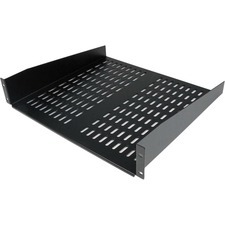 Supports 1U rackmount installation in 19 inch 2 or 4 post racks. Included cord retention bracket keeps vital network equipment plugged in and continuously powered.